Cynthia Bennett LPN and Skilled Unit Manager enjoys her job at Bellevue Health and Rehabilitation. Welcome to Bellevue Health and Rehabilitation, a family company with 60 years’ experience. Here, the licensed nursing and treatment team work together to develop a plan to meet their guests’ needs. Individual programs are designed, supervised and executed by a team of specialists. The team includes physicians, nurses, therapists, nutritional consultants and mental health professionals. Services close by include, Physicians, Physical, Occupational and Speech Therapy, 24 our nursing staff, Cardiac Rehab, IV Therapy, Neuro-Muscular Theory, Orthopedic Rehab, Respiratory Therapy, and Stroke Rehab Wound Care, Family On-Site 7 days a week. 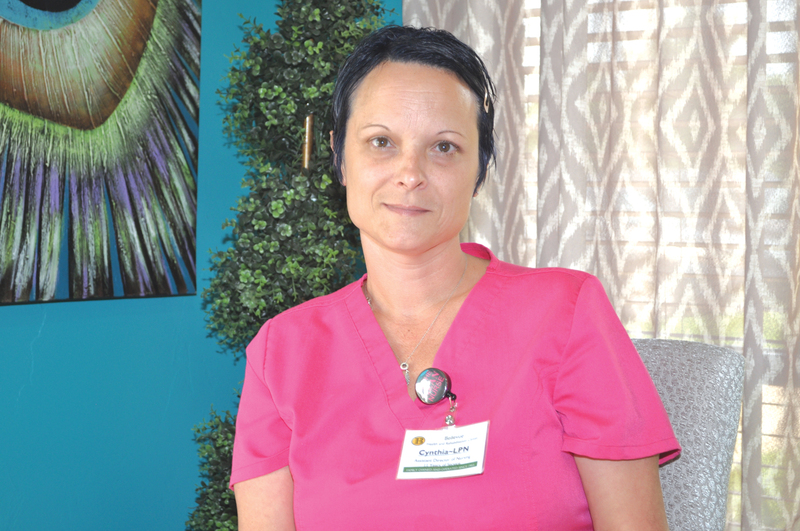 Meet Cynthia Bennett, LPN and Skilled Unit Manager. Cynthia served in the U.S. Army for 8 years, going to nursing school in the military. She has been a nurse for 22 years, going on 23, and has been at Bellevue Health and Rehabilitation for a total of 14 years. “This is a wonderful place to work, it’s a great company and I love my job,” Cynthia commented. Growing up in Chicago, it was quite an adventure moving to Oklahoma but Cynthia adjusted to it well. When I asked Cynthia what qualities she thought made a good nurse, her answers were quick and precise. “They would need critical thinking skills, time management, be able to pay attention to detail, have organization skills and most important, have a caring heart,” she said. Cynthia’s favorite part of her job is the fact that she can make a difference in a patient’s life. Cynthia is good at putting a smile on her patient’s face and forming a personal connection. She understands how they are going through rough times; away from their family, their surroundings, their pets, and it can be hard! “The more I can make my patient happy, the harder they will try to get better so they can go home. Getting to know a little more about the patient, getting to form that personal connection is enough to make the patient feel better, making it easier for them to accept the many changes in their lives,” she said. One of Cynthia’s biggest strengths is the fact that she always does her job. She would never tell anyone to do a job that she wouldn’t do herself. “I feel like I always give 110 percent, no matter what the situation is,” she said. A real challenge is when she is not able to fix the problem or able to fix the patient, that patient isn’t healing as well as they expect and this is when reality sets it. The patient can’t always be fixed. Between Cynthia’s husband, who is an x-ray technician, and her two kids, she also has 5 dogs and a cat. “If I could open a kennel, I would,” she said with a smile. Most of her dogs have been rescue dogs. Cynthia’s hobbies include putting models together, coloring and puzzles. In other words, anything that helps her destress. “All of those activities are very relaxing for me and it works wonders each time,” she said. What is the one thing that people will always remember about you? I ask. “I think they will always know that I am willing to do that job that someone else might not want to do. I am not beyond them. A few words that I like to live by are: every day is a new day, start each day as a brand new day, keep personal life as a personal life, and don’t bring your problems to work,” Cynthia commented. A heartfelt thank you to Cynthia Bennett for serving in the Military. She is an excellent nurse with a caring heart. To all the men and women that have served their country, past and present, thank you!